After reading each MPD Self-Assessment Survey statement, online respondents are asked to mark the extent to which they agree or disagree with each statement. The statements of the 39-question survey are organized into six categories: Self, Others, My Family, God and Religion, My Life and Destiny, and My Personal Life. For example, in the My Life and Destiny category, one of the statements reads: "I do want to find out if God has given me special talents and gifts to be of service to others." A strong agreement with such a statement may indicate a possible interest or potential in a priestly or religious vocation. The survey is meant only to be a tool of affirmation and one facet of discernment. 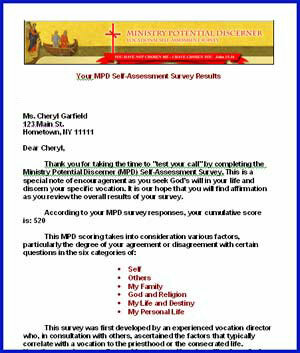 Reporting procedures for the MPD Self-Assessment Survey consist of an immediate on-screen score given upon completion of the survey. This score is also emailed to the survey taker. The email lists the three segments mentioned above, and it gives encouragement for the person to continue seeking God`s will through intense prayer and spiritual direction to discover one's vocation. The score and email is provided at no cost. It can be taken again and again. "Your over-all score on this Pre-Discerner Instrument was in the Top Segment of the various Groupings. This may, or may not, surprise you. It would mean that this letter could be an important event in your life, and certainly God is saying something special to you for your future." "You marked a 'Weak Agree' to the taking of drugs or alcohol for thrills, 'highs,' fun, etc. If this is not a mismark .... do pray about the strength of your convictions regarding the use of drugs and/or alcohol for thrills, kicks, or 'highs'; it may also be good to talk this matter over with an adult you respect and trust." At left is the first part of a sample analysis letter. An invitation to get this analysis is made with the email that is sent to the survey taker. Click through, and make payment via a secure PayPal connection. You will soon receive your four to six-page analysis via email.